Chamber President Bob Miller welcoming guests to The Hangar in Cloverport for our April Chamber Meeting. Congressman Brett Guthrie talking with the crowd at our April Breakfast Meeting. 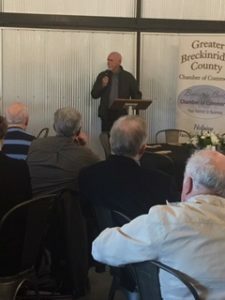 On Tuesday, April 16th, Congressman Brett Guthrie spoke to a group of citizens attending the monthly breakfast meeting of the Breckinridge County Chamber of Commerce. 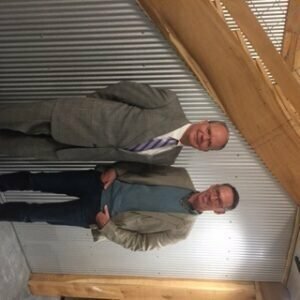 The meeting was held at The Hangar in Cloverport, which is a new event center at the Farm House Store & Diner. This venue was the perfect setting for our event and it was exciting to be the first to use this facility. 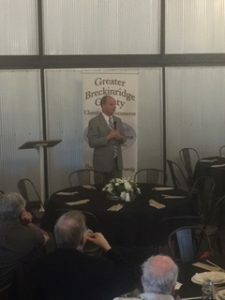 The staff did an excellent job of preparing and serving a delicious breakfast and Congressman Guthrie spoke to us of the bills in congress and why he takes the stand that he does on several issues. He is a well educated and well spoken man who loves serving the people in his district. This venue will work well for events such as weddings and family reunions. If you are interested in reserving The Hangar for an event or just want information on pricing, catering,etc., please contact Suzanne Flood at the Farm House Store. She can be reached at 270-702-2272. You will be glad you did.